July 4th is a time to celebrate our country. May we reflect on our heritage, our bountiful blessings, our customs, and our values of freedom and liberty for all. 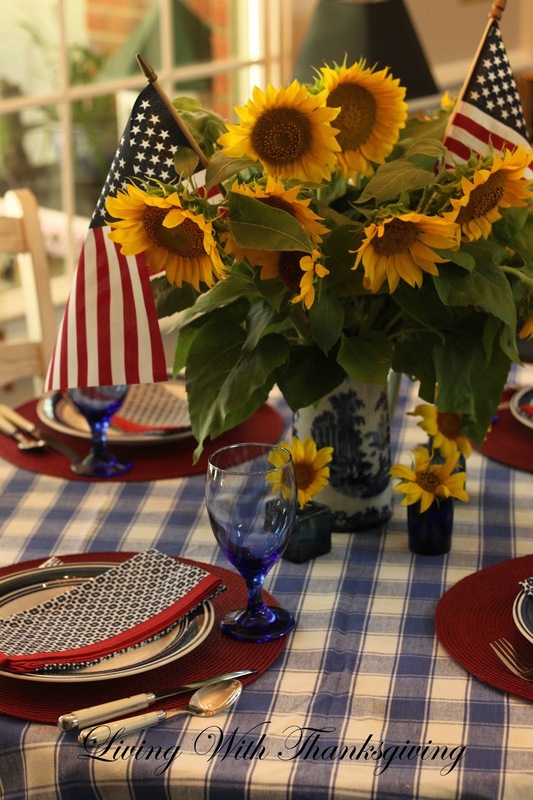 As we set our holiday tables in red, white and blue and prepare traditional barbecues for family and friends let us reflect on our wonderful country. I was delighted to read in my local newspaper today that Country Best Farms was inviting the community to pick free sunflowers at their farm. 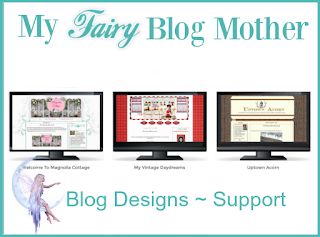 For a blogger that loves to tablescape that was music to my ears. Welcome to Country Best Farms in Enterprise, Alabama. 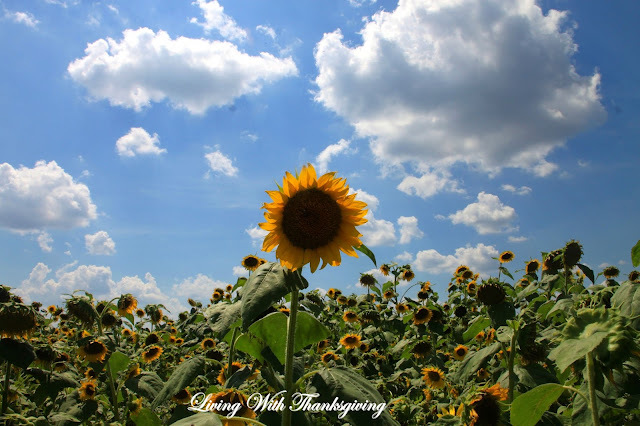 If you live in the area you'll want to head on over and pick some sunflowers. Large fields are loaded with huge sunflowers taller than me. The owners, Nancy and Bob Helms( you'll see Bob later) are two of the nicest people you will ever meet. new potatoes, tomatoes, squash, okra, onion, homemade ice cream, cookies, delicious pound cakes and homemade pies. So you'll also want to purchase some of their produce and baked goods. Here's Bob overseeing hand selected peas making sure each pea is the best quality. He explained the shelling process to me. 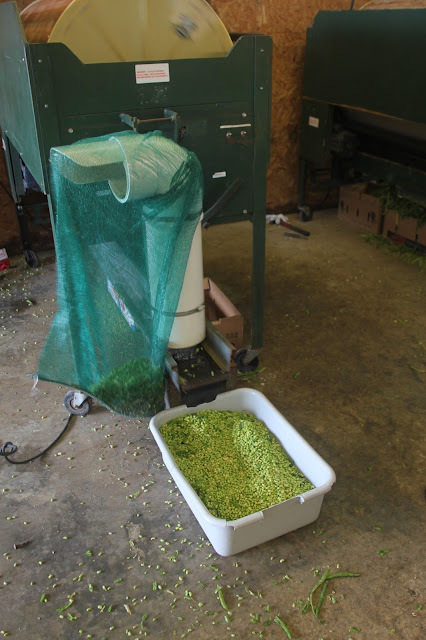 Have you ever seen a pea sheller? Or do you remember shelling peas as a child? I remember sitting on my grandmother's porch shelling peas and butterbeans. But these days, these fabulous machines do an excellent job. These 25 lb bags of peas are called hampers. For their homemade ice cream they use this interesting machine. I also remember the hand cranked home style ice cream freezers. The bees were everywhere feasting on the flowers. I had a wonderful time cutting the sunflowers thinking of the perfect vase I had for them. 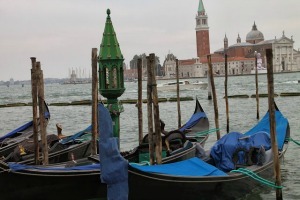 Then the idea to do a tablescape right here with the most perfect backdrop ever was born. Voilà! I even had the perfect sunflower tablecloth! This was fun despite the humidity and 90 plus degree heat. 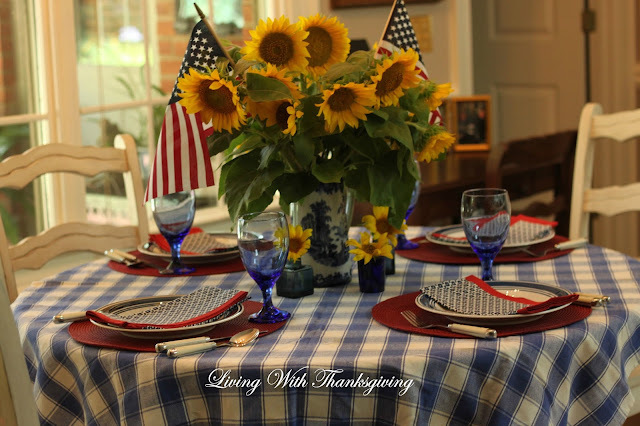 The term tablescape has only recently made it in the dictionary and when you type the word a red line appears as if it is misspelled, however, in the lifestyle blogging world tablescaping is now a hobby. 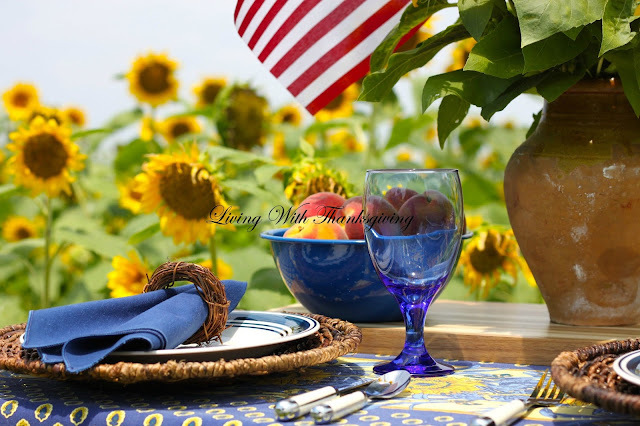 This could simply be a summer tablescape but by adding the flags it is representative of a Fourth of July tablescape. I've enjoyed tablescaping for over six years now. You may view another tablescaping field trip related to the South here. Country Best Farm is beautiful and I had fun but the nicest part was getting to know Nancy and Bob Helms. Thank the two of you for such a nice day! I hope you enjoyed the tour of Country Best Farms and the sunflower fields. 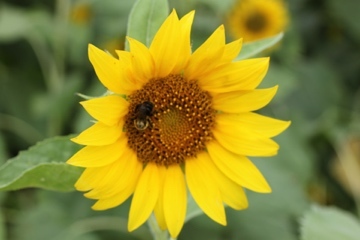 Locals don't miss this opportunity to enjoy picking your own sunflowers. May God continue to bless and protect this great nation. Happy July 4th! The saga continues.... you may be wondering what were the pics at the beginning of this post about? 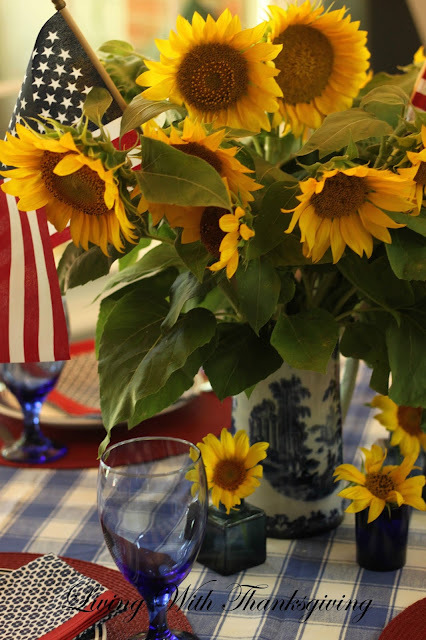 When I got home I decided to do a Fourth of July table for my kitchen using the sunflowers in a different setting. To change the tablescape I added a blue and white tablecloth, red placemats, and Cynthia Rowley napkins from TJ Maxx and changed the vase for the flowers. Which tablescape do you like the best? I can't decide. I enjoyed both of them. Living thankfully, Bonnie. I appreciate all of my readers. Have a great holiday weekend. 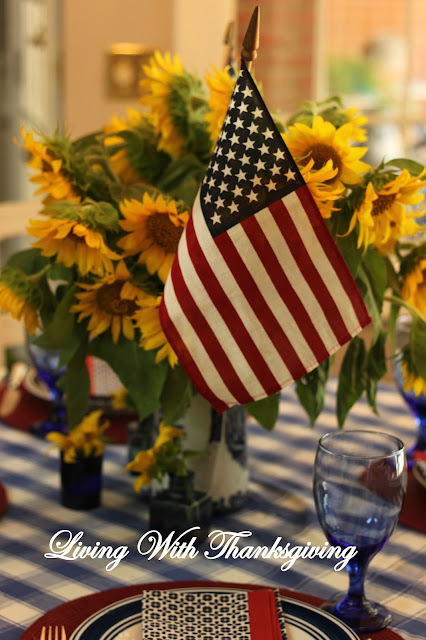 Labels: Country Best Farms, Fourth of July tablescape, Patriotic tablescape, red, Sunflowers, White and Blue. Bonnie, this is so wonderful! I LOVE your tablescape in front of the sunflowers, it's beautiful! Actually both of your table settings are wonderful but what a dream come true to create a table surrounded by big, beautiful sunflowers! I also love the vase you used, feels like it came right out of Italy! 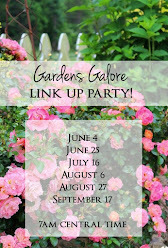 If you don't get many visits to this post from TT this week since it's Friday already, and right before a holiday when a lot of folks are traveling, etc..., please be sure to link it up again next week. 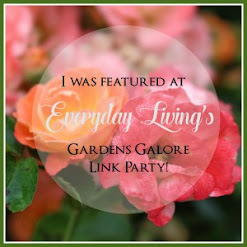 This is too special for folks to miss! Wish I lived near Country Best Farms! What a special place to buy your veggies and to shop. 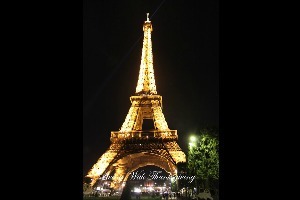 Wow it's awesome! I love your table with the sunflowers in the background !! 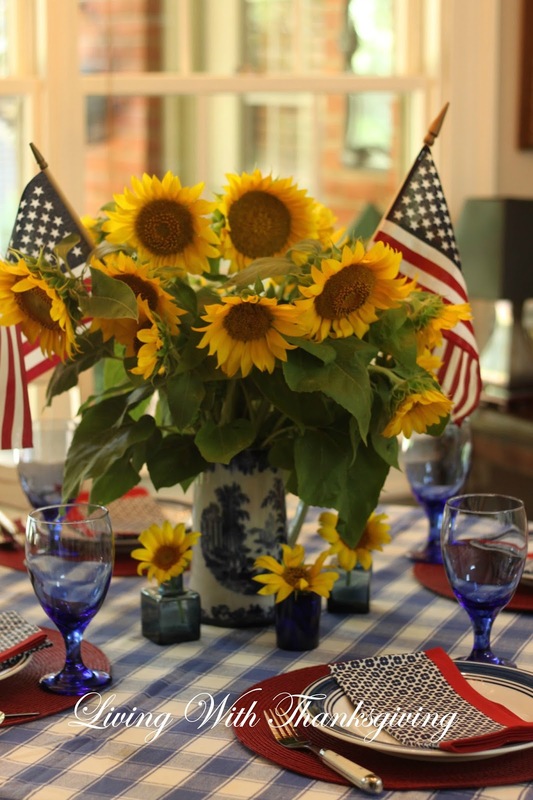 I agree with Susan both your patriotic tables are so pretty. I love the farm and it reminds me I should post me going to the farmers market shopping for veggies and all. Happy 4th. of July dear Bonnie. What a delight this post was as you took as through the lovely Country Best Farm. We have to drive two hours to get to any farm type vegetables and fruits. Those sun flowers are gorgeous and how sweet of the owners to allow free picking this weekend. Your table out in the field was adorable! Love the tablecloth. Your sunflowers are gorgeous! Is there anything that says summer more than those flowers? Nope! What a beautiful post, Bonnie!! 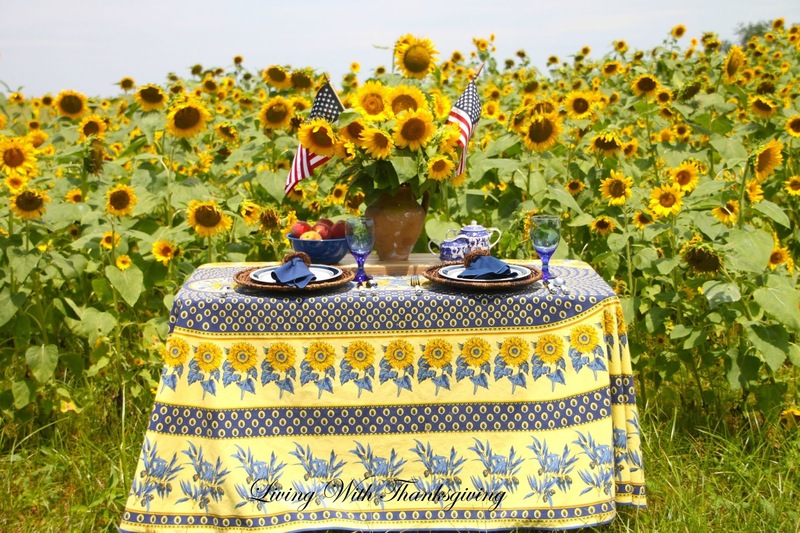 How lucky you were to be able to set this pretty table in the sunflower field! It all looks straight out of Provence; I'm betting that sunflower tablecloth came home from France with you. :) Country Best Farm looks like my kind of place -- love all the fresh produce this time of year. It's hard to say which table I like best, as they are both lovely. 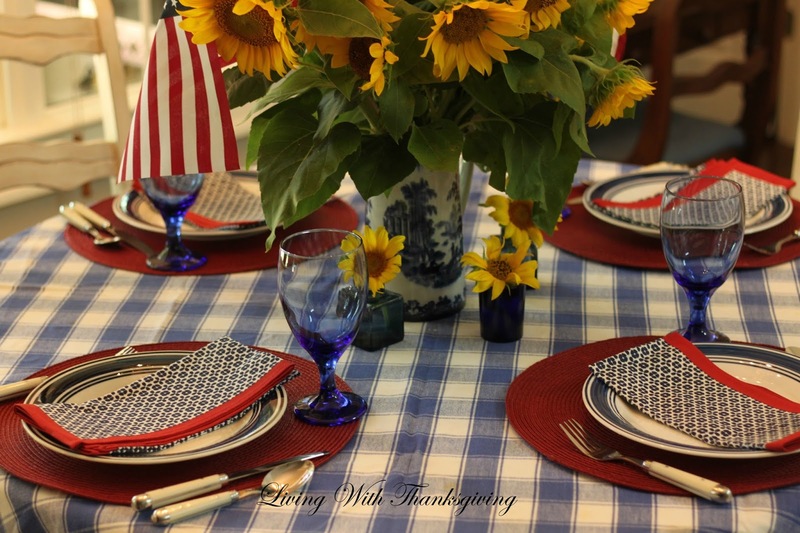 I have a blue and white checked cloth very similar to yours; yours looks so perfectly summery for the Fourth of July. Thanks for sharing Bonnie, and have a very Happy Fourth, my friend. Also, your tablescape took my breath away. Beautiful, my friend! Happy 4th of July! Hugs! Wow! 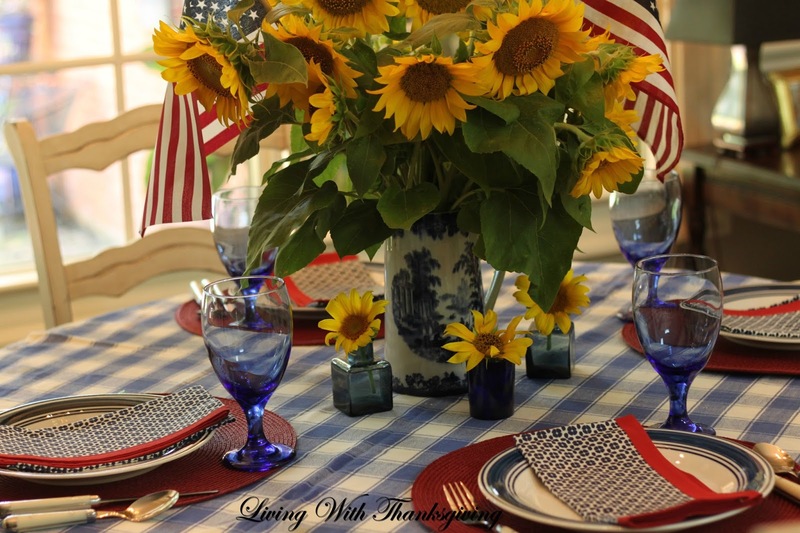 This is one of the prettiest patriotic tablescapes and photos that I have seen. Beautiful, Bonnie. Your tablescapes look amazing. 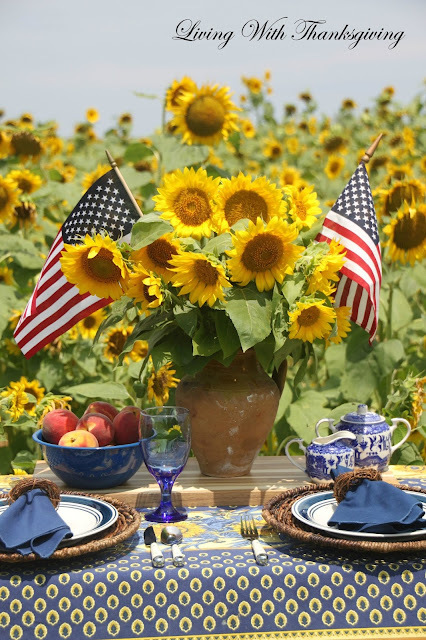 I love the sunflowers with the flags. It sounds like you had a fun outing to Country Best Farms as well. Bonnie, I love both of these! When you were focusing on the farm, I thought your tablescape there was a photoshop of the sunflower fields into your backyard or somewhere else outside! How nice that Bob & Nancy were agreeable to your tablescaping antics (which was probably good for business, I would imagine!). The table at home is really nice too - those Cynthia Rowley napkins are pretty. The tiny blue bottles at the base of your centerpiece look adorable too. Oh my, I love both tablescapes. It would be hard to choose. I adore Sunflowers and those made a stunning centerpiece for you table. The backdrop of sunflowers in your one tablescape was stunning. That picture belongs in a magazine! Gorgeous!!! I enjoyed the tour of Bob and Nancy's Country Best Farm, Bonnie, and both of your pretty tablescapes. Aren't those sunflowers fabulous? They make for such a cheerful centerpiece. Happy 4th of July to you and God Bless America! Must I choose, dear one? I l o v e Sunflowers, so I l o v e them both! Thank you for sharing Nancy and Bob with us! What a wonderful post, filled to the brim with good hearts, spirits and down home goodness that I miss every-single day of my life! In fact, I just want to move here and live with these genuine, hardworking and inspiring people! After growing my own sunflowers and experiencing their fleeting life span, it make me appreciate even more the dedication it requires to grow an entire field of them. Just wondering how they harvest them? Are they individually cut? 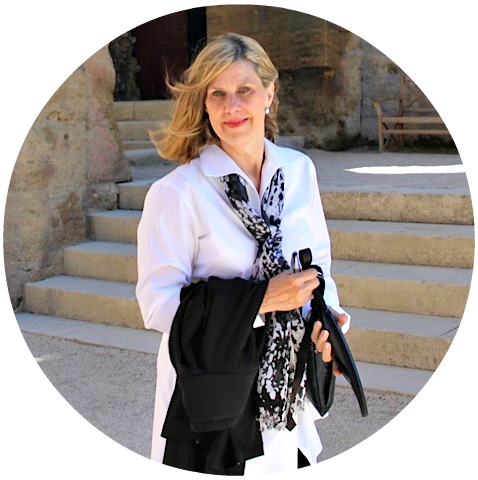 Your tablescapes are fantastic and I love them both and oh your tablecloth is wonderful! Bonnie, I love this post, you had me at sunflowers! What a fun farm in Enterprise with all those fresh offerings plus free sunflowers for the picking! I love that you took your Tablescape on location, that looks like fun in spite of the heat! Your breakfast table looks like the perfect place for a country breakfast including some grits, maybe? So lovely! Hope you had a great fourth! What fun Bonnie! I wonder why they let people come pick for free? I love that you took your tablescaping things along for the "field trip!" The tablecloth and flowers are perfect with the red white and blue, it's so Americana! What a great opportunity! You did a wonderful job of planning ahead for your tablescape. The tablecloth is perfect and the vase loaded with sunflowers is amazing. I also love how your tablescape looked at home. Wonderful red, white and blue table and with those gorgeous sunflowers- it's perfect! I love your table setting for the 4th. The one in the sunflower field looks stunning! There is a sunflower field not far from us that allows people to buy them and take pics using them in the background. It's always so pretty to drive by there. 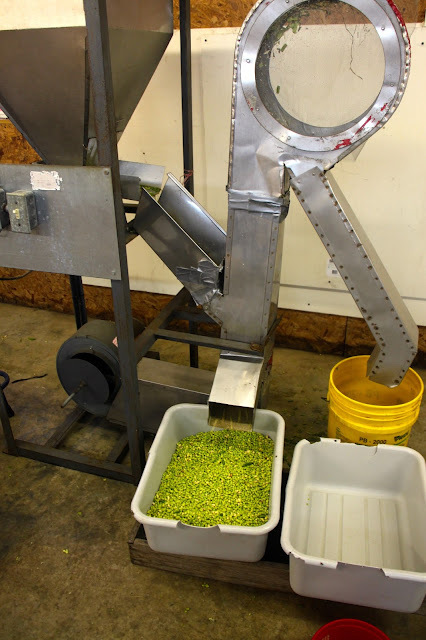 I've never seen a pea sheller before. Really neat to see how it works. 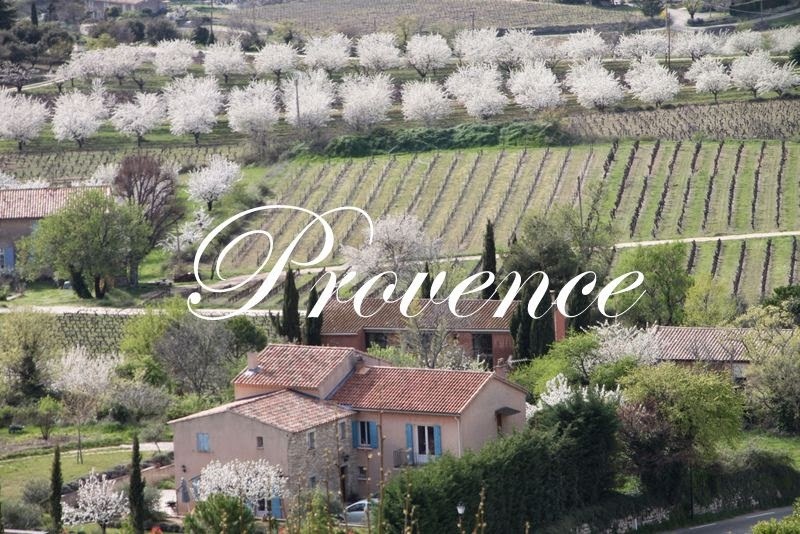 What a wonderful place to visit, I love produce fresh from the grower. And to have a chance to set your pretty table against that gorgeous field, just brilliant. 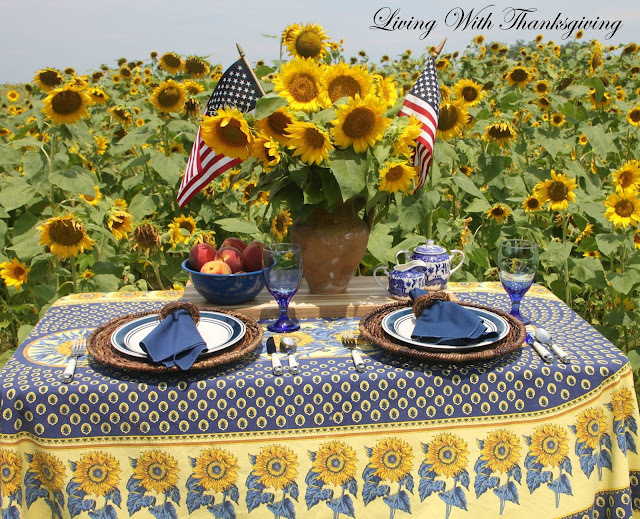 All your photos and tablescapes were amazing.....especially loved the table in the sunflower field..........oh my.....it is just breathtakingly beautiful. Swoon Bonnie! 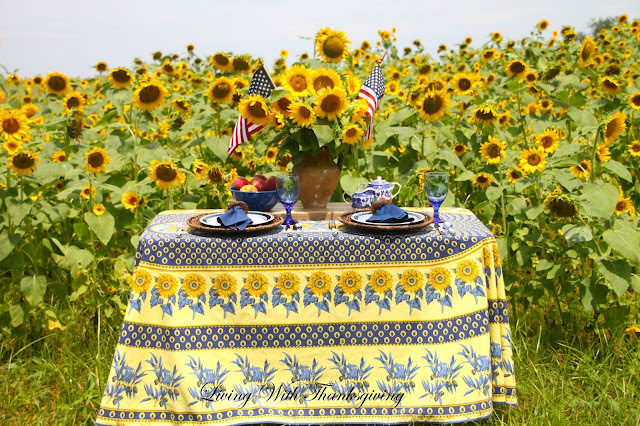 Your tablescape with the sunflower field makes my heart sing! 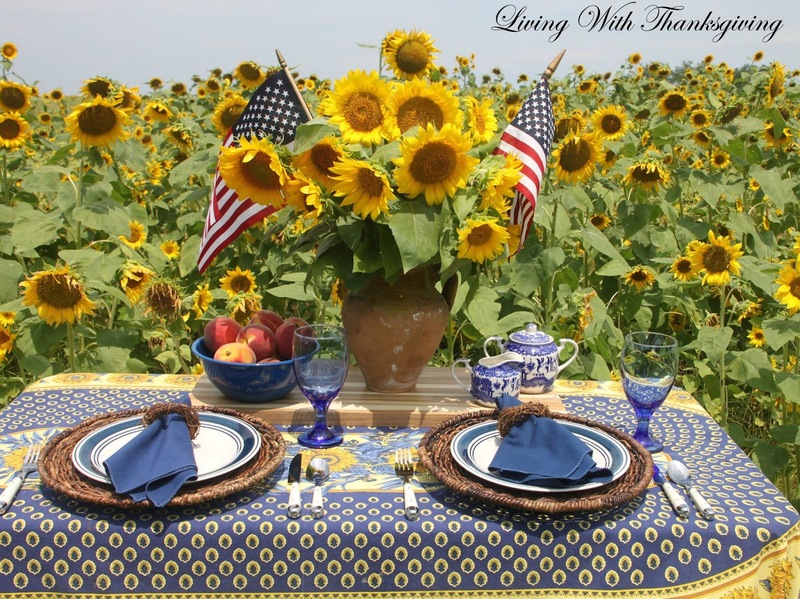 What fun to pick your flowers and set the table in field, despite the heat and humidity and I adore your tablecloth! You table indoors in the comfort of the a/c is equally beautiful. I wish we had a farm near us to pick. Just beautiful!!! Bonnie, that has to be one of the prettiest settings for a tablescape I have ever seen! Straight from a magazine cover! Wow, those sunflowers were just breathtaking and I am so happy they invited you in. What a fabulous place with the pea sheller and ice cream maker! Oh, yes I remember hours of peas - now I just grow the ones I can eat the whole pod and all - saves me hours and hours! What a charming little store and your sunny and cheerful tablescape is a delight Bonnie! This is a beautiful post..the whole thing. 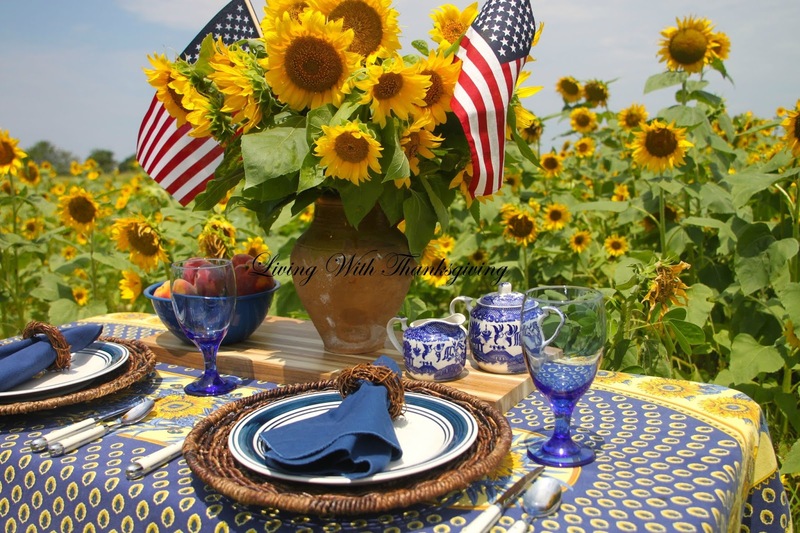 I just love the idea of setting up a tablescape in the sunflower field..